This doll was made as a "Brown Bag Doll" from a pattern by Sylvia Schorr. The pattern was for Electra the Witch from Chadsworth Street found in the November 2002 issue of Soft Dolls and Animals magazine. 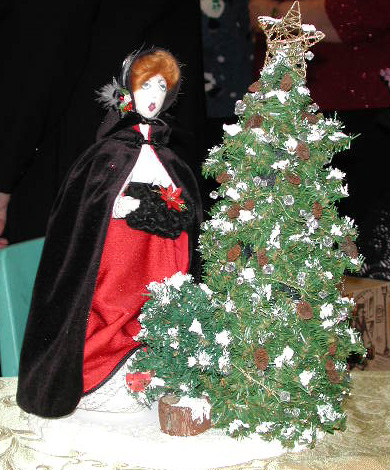 The stump doll body was made by Peggy Fadyk. She was beautifully outfitted and accessorized by Jacquie Lecuyer, Jo-Ann Raven, Maxine Robertson and Peggy Wilson.